I’ve been resisting writing about this since I heard the news last Sunday. I quite literally don’t know how to deal with it. I got the news via text message and I started crying, in a very public place. This is worse than the feeling I had when Majel Roddenberry passed away. You see, Bea Arthur was the one famous person I really and truly wanted to meet. I’ve always had a place in my heart for strong women, and most of that place has been occupied by various action heroines and comic book characters. So Bea Arthur being thrown into that mix might strike some people as odd, seeing as how she dominated in the genre of television comedy. She never threw a punch or knocked out a bad guy. But her wit was lightning quick and her comedic timing was absolutely razor sharp. She was the queen of strong women on television. She was a powerhouse. She could reduce you to absolute tears of laughter with a single facial expression. She was so smart with her comedy that she could slay an audience with a single line. 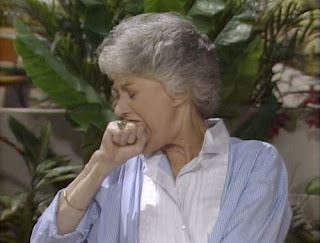 Like most women my age, I grew up watching Bea on The Golden Girls with my grandma. I own all seven seasons, my Golden Girls t-shirt is my favorite item of clothing, and the show gets played on regular rotation at my house. Sometimes it’s just on as background noise; the mere familiar sounds of it comfort me as I cook dinner or do chores. I have my favorite episodes, and my favorite moments and lines. They don’t call it a cult classic for nothing. You see, fans like me are not rare. I know at least a handful of them in my close circle of friends. Sure, Golden Girls is fodder for a lot of jokes today, a lot of tongue-in-cheek humor, particularly at the expense of Bea Arthur. Because she just never fit into anybody’s mold. She didn’t technically belong anywhere. Her voice was “too deep”, she was “too tall”, and the criticisms go on and on. She made people uncomfortable, and that’s what she thrived off of, it’s where her comedy came from. She took what was surely her source of pain and made it into her gift, and her income. So it makes sense to me that she’s just a joke to a slew of people, and not in a good way. I guess it’s that high school boy hiding inside of the general public that just can’t resist taking a stab at her appearance or her stature. Pardon me if I'm a bit defensive...I told you, I loved this woman. 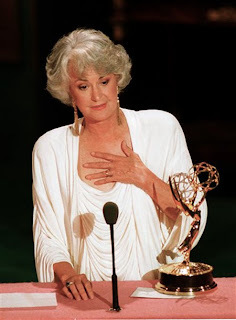 Bea once told a story on a Golden Girls behind-the-scenes special feature about trying to be a jazz singer, and how she got laughed off the stage because of her deep voice. That would crush most people. Forever. But not her, she figured out right then and there that she was meant for comedy and she just went for it, metaphorical guns blazing. That, to me, takes great strength. Years later, she finally got the opportunity to sing on the show, and she did a beautiful rendition of Irving Berlin’s stunning, “What’ll I do” that will take on a whole new meaning to me now. Naturally, she still found a way to make it into comedy gold. But what can I honestly say? All I could do would be to trip over myself begging for you to genuinely give Bea a chance. But actually, I think everyone really loves her, even if they feel they have to in secret because they don’t want to admit flipping to the Lifetime channel to watch her in re-runs. She, like every other legend of comedy, knew how to draw all of the attention from the audience at all times and every scene she was ever in, she stole completely. What made her even better? She knew this about herself, and she was gracious with her larger than life presence. She wasn’t a scene hog. She wasn’t a diva. She even chose to leave the Golden Girls after the seventh season, when it likely could’ve gone on for much longer, because she was afraid she didn’t have it in her anymore. So maybe it wasn’t humility, but perhaps that which lies at the heart of every true comedian, self-consciousness. Whatever it was, I can’t tell you how sorry I am to have never experienced it in person. I can’t tell you how much more I will cherish my worn down DVD’s of my favorite television show. Now, every time I crack up at one of her scathing looks to the also departed Estelle Getty, I’ll feel a twinge of sadness. Because there’s just nobody like her. There are no young Bea Arthurs out there, no up and coming character actresses that even come close to her genius. It’s a different world now than it was when she came up in the entertainment business. You have to look a certain way, for the most part, to get anywhere now. Can you imagine anyone on television or in the music industry looking the way people did even 20 years ago? I’m just doing a really awful job of this. I’m a writer, I’m supposed to know what to say, exactly how to put it. But I can’t. So I guess I’ll just say how I really feel, despite how obnoxious this makes me sound. Bea, you have no idea how much I respect you. How much I wish I could make a dent in the world even one tenth the size that you did. To break barriers, to inspire such raucous laughter, to take such great strides for women in the entertainment industry, and to so completely get over myself the way I’m sure you had to after facing the criticisms that you did in this world. You will be sorely, sorely missed, even by people from a generation born after Golden Girls started airing. You didn’t realize it, but you were an absolute legend. You affected our lives, deeply. An entire generation of little girls grew up watching you, and you taught us that it’s better to be smart than to be a bimbo. That there’s a place in this world for women who don’t fit the mold and that it’s very important to always have a good comeback. For that and more, I am genuinely thankful, and I’ll continue to draw inspiration from your legendary comedy for the rest of my life.